Well, that was a lovely hiatus on Mass books, wasn't it! I am not sure anyone is using these though, and I haven't gotten any complaints so I am not going to worry about it! 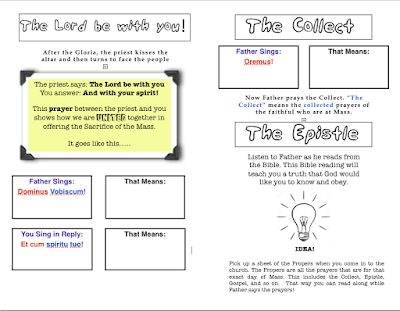 The latest section is the Dominus Vobiscum, Collect and Epistle. As before, save to your desktop and then drag and drop into pages or word to print out. So all they have to do is fill in the boxes with the translation, color the bubble words, and jazz up the page. They can also color the light bulb. I'll be working on the Gradual, Alleluia and Gospel next!